The humble and affordable cast iron pan has an impressive, centuries-long track record, proving that high-tech isn’t always better and that quality doesn’t have to be expensive. We know, we know. All-Clad and Le Creuset have long been the gold standard in the kitchens of professional chefs (and, more recently, have become all the rage with home cooks), but there’s still nothing quite like a good, old-fashioned cast-iron skillet. Sure, they’re heavy and get low marks on speed, but these slow-to-warm ugly ducklings score well where it matters most: versatility and lasting performance. They distribute heat evenly and are virtually indestructible. And although cast iron may not impress your guests like flashy high-end cookware, you’ll constantly find new uses for these sensibly-priced workhorses. Ideal stove-top-to-oven companions, we use ours to fry bacon, sear meat and fish, sautée onions, roast chicken and root vegetables, and bake cakes and homemade cornbread. 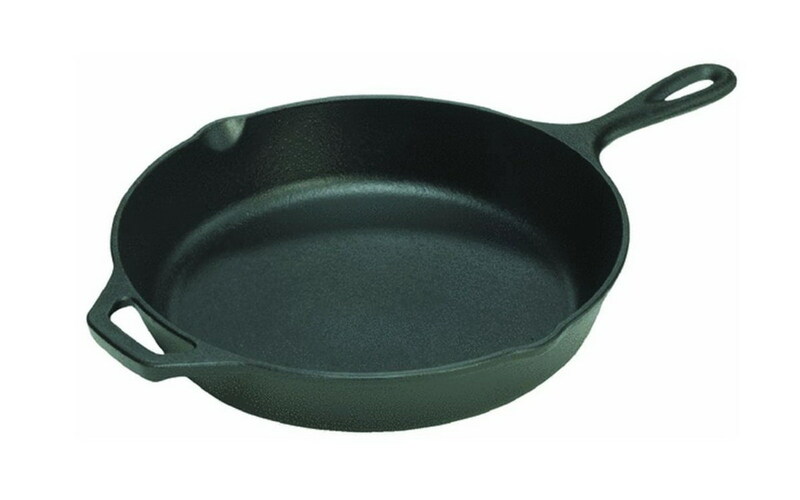 This 10 ¼” American-made version, by Lodge, is pre-seasoned, so it comes ready to use. To maintain the naturally nonstick “seasoning,” scrub off stubborn food particles with a scouring pad, stiff brush or coarse Kosher salt, rinse, then dry thoroughly before storing away. With proper care, its surface will become well-seasoned, improving over time. $15.99; target.com. This entry was posted in Cooking, Uncategorized and tagged cast iron pan, cast iron skillet, cooking, cookware, kitchen, Lodge cast iron, pan, skillet. Bookmark the permalink. There’s nothing like fried chicken made in a cast iron pot. I’ve had mine for over 15 years. It gets better with age. Only one thing I do not like about cast iron–I’m always afraid I’ll make it rust. Would never want to do that, so it sort of scares me. Still do love it. I have my Great Grandmother’s cast iron skillets and also the dutch oven, roasts are to die for in the Dutch over, corn bread in the skillet is amazing, and of course the once in a great while fried chicken fried in the skillets. Just really like the cast iron.